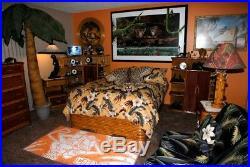 Quite possibly the largest single important collection of Frankl Rattan owned by a single person in the world. 8 band 4 section sofa. Matching 8 band chair. 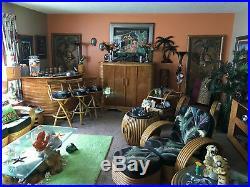 Pair rarest 6 band spiral armchairs possibly Kem Weber or Paul Frankl. Frankl 6 band 3 section curved sofa. Pair of rare planter consoles. Ultra rare rattan wardrobe. Stacked Rattan coffee table. Coffee table Fish Bowl. Pair of rattan stacked end tables. 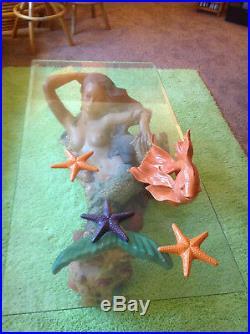 2 Mermaid Coffee tables. 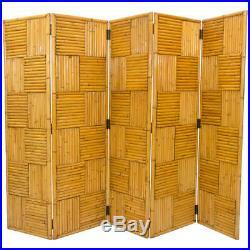 5 section rattan screen only one ever seen. 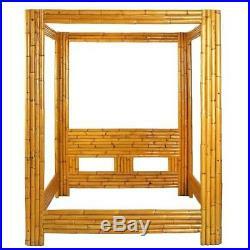 3 section rattan screen. Coco Bongo Monkey Panel from the movie The Mask. 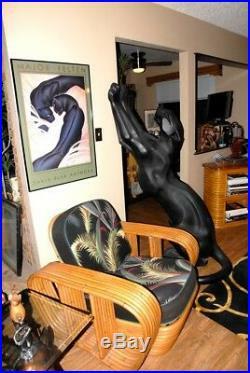 Pair of 6 foot tall fiberglass standing panthers. Pair of matching bookcases one curved for corner and other straight. Additional curved and straight bookcase. 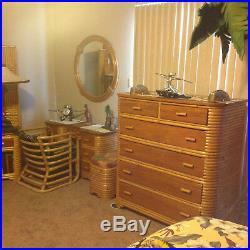 Rattan queen size 4 poster bed. Kidney shaped coffee table. 3 band rocking chair. 5 band 3/4 pretzel chair and matching 3 section sofa. Stacked rattan full size bed. Very wide, tall chest of drawers. Flamingo Relief Panel from Flamingo Hotel in Vegas. Grouping of I think 5 various circle shelving units including one approximately 4 feet wide. 6 Band caterpillar chaise lounge. 29 Massive 1/4 circle bar with 4 matching stools. Amazing pair of fish chalkware lamps. Vanity with mirror and stool. Additional stacked chair for vanity. Circular rattan picture frame with Coco Bongo monkey artwork. Complete set of 4 Doug Horne Fender guitars with custom artwork with all 4 pieces of matching artwork edition of only 100. Pumpkin or Pineapple Bar. Betty Grable swimsuit clock. 6 foot long solid Phillipine Mahogany double pedestal dining table with 5 chairs. 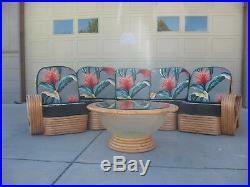 5 foot smaller solid phillipine mahogany dining table with 5 =chairs, all woven cane, beautiful. Pair of Bamboo Valances. 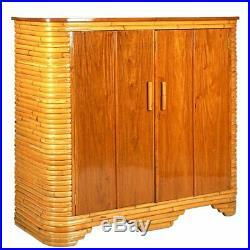 3 section rattan sideboard 41. Major Felten Single Panther Poster 42. Major Felten Double Stalking Panthers 43. Pair of Native Dancing Chalkware Lamps with best shades ever 44. One of a Kind Jason DeNaro Oil Painting of Panthers, huge 45. Los Angeles Steamship Company Poster in Bamboo Frame 46. Coco Bonga art in circular rattan frame 47. 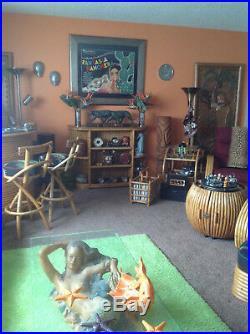 Various large Tiki sculptures 50. Rattan stacked fish tank 51. Rattan Teacart #1 52. The item “Massive Frankl Rattan Collection, one most important private collection in world” is in sale since Sunday, October 22, 2017. This item is in the category “Antiques\Periods & Styles\Art Deco”. 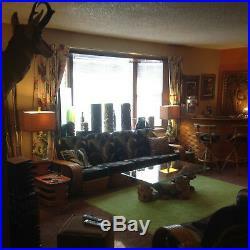 The seller is “streamlinedgoods” and is located in Grand Junction, Colorado. This item can’t be shipped, the buyer must pick up the item.